The Lockhart River Art Gang is having a big year in America now, following on the major exhibition mounted by the University of Queensland and Sally Butler, Our Way: Contemporary Aboriginal Art from Lockhart River. 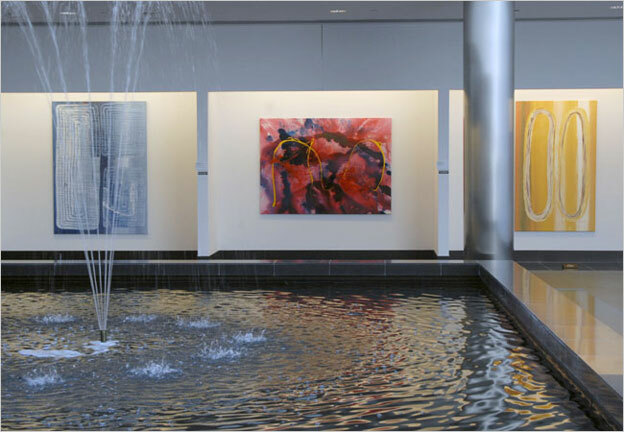 The exhibition itself is touring the United States, and is recently ended a successful run at the Charles B. Wang Center atStony Brook University, located on Long Island just east of New York City. The Australian took notice, as did the New York Times. Sally Butler presented a lecture, “Art and Intellect in 21st Century Aboriginal Art” at the University on October 10. Other Indigenous-themed events included screenings of Ten Canoes, and Darlene Johnson’s filmsStolen Generations , and Crocodile Dreaming. 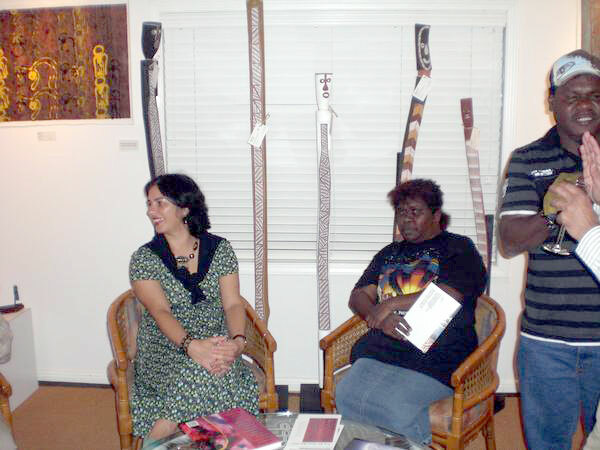 Photographs of the exhibition’s opening, where Rosella Namok and Wayne Butcher spoke are available here . Our Way moves on next to the Kluge-Ruhe Aboriginal Art Collection at the University of Virginia, where it will open on January 15 for a two-month run. The University of Virginia is the only North American member of an international consortium of universities that also includes the University of Queensland, and to mark this collaboration Professor Terry E. Smith will deliver a University Distinguished lecture on February 13, 2008. Smith is the Andrew W. Mellon Professor of Contemporary Art History and Theory at the University of Pittsburgh, and a Visiting Professor in the Faculty of Architecture at the University of Sydney. Halfway across the United States, there was more excitement surrounding recent work by the Art Gang, at the Booker-Lowe Gallery in Houston. 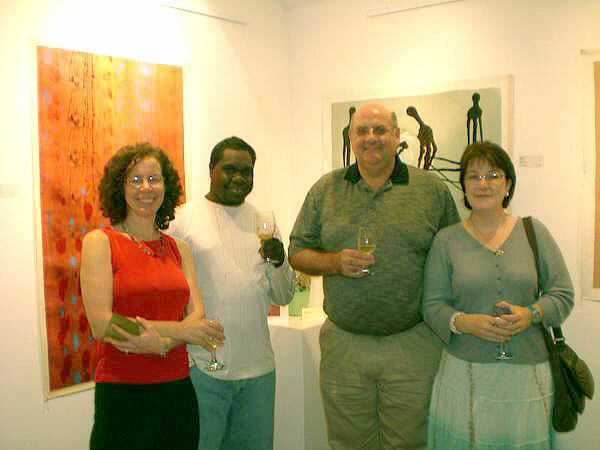 Artists Adrian King, Leroy Platt, and Joanne Butcher joined Nana Booker for the opening celebrations on November 1. 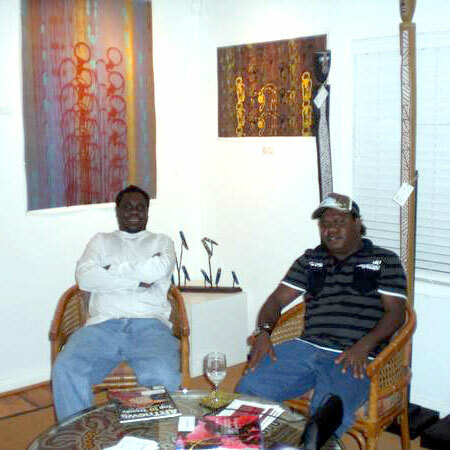 The show feature small-to-mid-sized works y both the established stars of Lockhart River as well as the “second generation” of artists to emerge from the community. I’m often asked about the market for Aboriginal art in the United States, and always wind up referring to Nana and her gallery, which is one of the few that specialize in Indigenous art in this country. This is the second time that the Gang has visited Nana in Houston, and from the looks of it, they once more had a wonderful time. The current show is on until January 18, but that isn’t the end of the story. 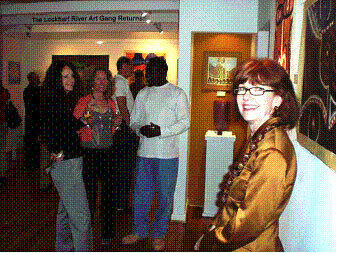 Late January 2008 will see the arrival at Booker-Lowe of more works from Lockhart River, as the larger canvases now on display at the Institute of American Indian Arts in Santa Fe, New Mexico, arrive in Houston. Nana has been tireless in her enthusiasm for and promotion of the Art Gang, and it’s good to see these exhibitions helping to raise their profile here in the US. To complete the circle, Nana will be sending some of the work from the IAIA show on to the Kluge-Ruhe later in the spring. Nana was also kind enough to send me some photos from the opening at her gallery. Leroy Platt raises a toast to Australian-American Chamber of Commerce President Greg Foley, his wife Beverly, and a friend.